Want to skip ahead? Download our Risk Parity Solution Brief now. Last week’s sharp sell-off in JGBs renewed concerns of forced selling by risk parity funds. While the drawdowns in US Treasuries, US equities, and ultimately risk parity portfolios were small and short-lived, the latent risk remains worth monitoring, as (i) leverage is still near max levels across a variety of risk parity parametrizations, (ii) bond allocations are historically elevated, and (iii) markets continue to be skeptical of a 2016 Fed hike. In plain English, they’re trying to help clients figure out what might trigger widespread forced selling. The grey bar is the zone in which the risk parity funds aren’t forced to sell. So, for example, if there was a -2% drop in US Treasury futures and a 5% jump in the S&P 500, risk parity funds wouldn’t react. The orange zone includes the events that would presage a dramatic deleveraging. Their model suggests that, for example, a -1% drop in US Treasury futures and a -4% drop in the S&P 500 would trigger forced selling. Unfortunately, this characterization of how Risk Parity works is misguided for a number of reasons. Let’s examine how Risk Parity actually works, and address the most important misapprehensions from the article in turn. Risk parity is characterized by three primary features. First of all, Risk Parity implementations almost always invest in a diverse basket of asset classes which react in different ways to various economic environments. That means they are more than just traditional portfolios of stocks and bonds. Rather, they include assets like commodities and gold, inflation protected securities, assets denominated in a wide variety of currencies, and more obscure assets like emerging market bonds. So it is incorrect to state that Risk Parity implementations will react exclusively to changes in risk and correlations in stocks and bonds. Second, Risk Parity is about balancing risk. To balance risk, high risk assets like equities must necessarily receive a smaller allocation in portfolios than lower risk assets like bonds. For this reason, Risk Parity portfolios allow assets with diverse risk profiles to contribute equally to the portfolio. This means the portfolio doesn’t rely on just one or two sources of returns, but rather accrues returns from many sources, which as stated above, produce their best returns in different economic environments. While all Risk Parity implementations apply the concepts described above, they can implement them in more than one way. For example, the progenitor of Risk Parity products is Bridgewater’s All Weather Portfolio. Bridgewater analyses the fundamental relationships between assets and different economic regimes to construct a strategic Risk Parity allocation. In other words, the All Weather fund has a relatively static asset allocation, and rebalances back to this allocation on a regular basis. As such, it acts counter-cyclically by buying assets that have gone down the most and selling assets that have gone up the most. This implementation actually moderates the behavior of markets, in direct contravention to the claims made by the BAML note. Other Risk Parity methodologies are more dynamic. Portfolios are altered regularly in response to changes in observed correlations and risks across global asset classes. All things equal, if an asset class starts to exhibit higher risk, and/or higher correlations with other assets in the portfolio, these dynamic approaches will reduce exposure to this asset class in favor of other assets in the portfolio. As always, the ultimate goal is to maintain maximum diversification. The third distinguishing feature of Risk Parity strategies is that they are usually managed to a target volatility, so that to the greatest degree possible investors receive the experience they signed up for, even during the most hostile market conditions. Of course, while investors are concerned with the volatility of their investment experience in the short-term, in the long-term they are ultimately concerned with wealth generation. For this reason, many Risk Parity managers target higher levels of risk in order to achieve higher returns consistent with investor requirements to sustain portfolio income needs. The only way to achieve higher risk/return targets with a maximally diversified portfolio is to use leverage. But the leveraging/deleveraging process isn’t nearly as sensitive as what is implied in the report. And many large Risk Parity implementations don’t react at all to short-term changes in market risk. Some risk parity implementations – like All Weather for example – employ leverage in a strategic sense, based on long-term estimates of asset class risks and co-movement relationships. As such, these strategies do not react to short-term changes in risk or correlation, and do not deleverage or re-leverage as market risk ebbs and flows. Other strategies respond dynamically to current market conditions, and scale exposure up or down to deliver a more stable experience in all market environments. Only those strategies that dynamically manage portfolio volatility based on local risk and correlation have the potential to materially alter total exposure over time. As you can see, there is nothing inherently nefarious about Risk Parity. It is simply a way to avoid concentrating risks in assets – like equities – which are designed to thrive in just a narrow spectrum of possible economic states. Now that we’ve highlighted the salient features of Risk Parity, and how these strategies are typically implemented, let’s dispel some of the misapprehensions that were proposed in the report under discussion. You will see that the market in general has little to fear from Risk Parity, and in fact it is a compelling solution for many investors to consider as an alternative to the UNbalanced 60/40 portfolio. 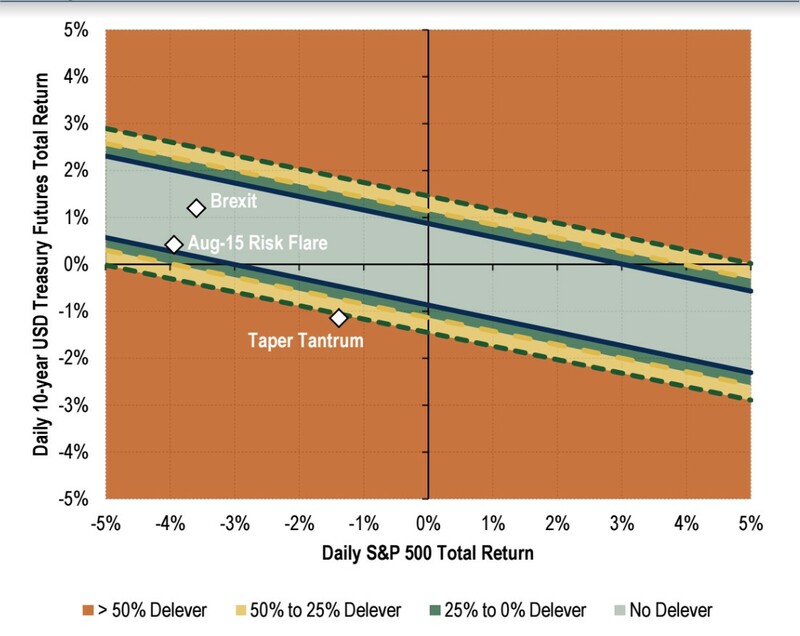 Reality #1: Risk parity is reactive, not proactive. The report in question asserted that Risk Parity may be at the ‘epicenter’ of the next market crisis. But this is fundamentally impossible, as it confuses cause and effect. That’s because dynamic Risk Parity strategies will only act to reduce risk if risk is already increasing. In other words, there must be a fundamental or structural issue in markets that has sparked an expansion in risk (and a convergence in correlations) before Risk Parity funds would take action. We acknowledge that, once risk really starts to accelerate higher in markets, dynamic Risk Parity strategies may exacerbate the issue at the margin by reducing overall portfolio exposure to maintain risk targets. But they will never ‘trigger’ a market crisis on their own. Reality #2: Risk Parity doesn’t have sufficient assets – especially in risky asset classes – to create a disproportionately large market impact. In order to amplify a major market event, Risk Parity assets must necessarily represent a meaningful share of global markets. However, according to recent estimates, there is only about $600B deployed in Risk Parity strategies globally. While this might seem like a large sum, it is actually rather small relative to the size of the liquid global markets in which these strategies invest. A 2014 paper by Doeswijk, Lam and Swinkels estimates the investable global market portfolio at $90.6 trillion as of 2012, while other estimates put the figure at over twice that amount. 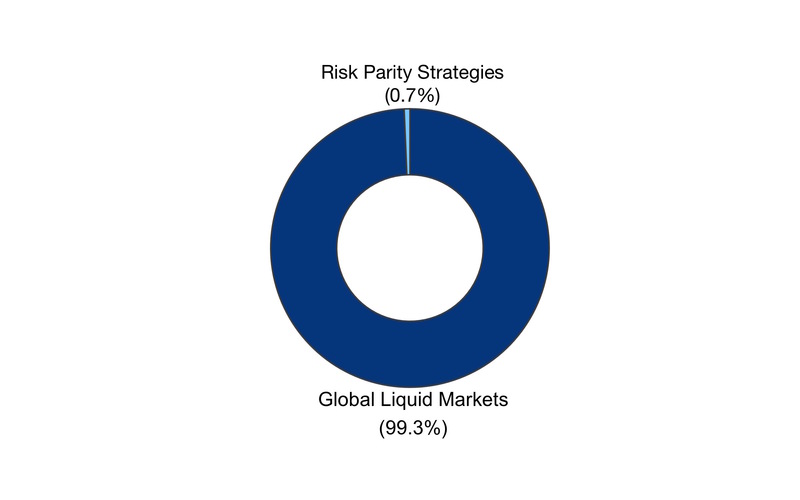 So Risk Parity strategies represent less than 1% of global liquid market capitalization. Figure 1. 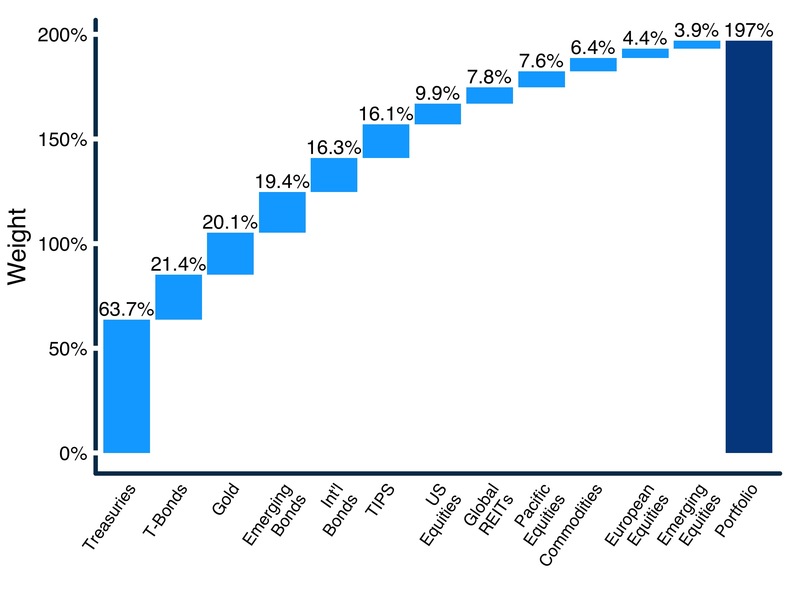 Risk parity assets as a proportion of global liquid market capitalization. Now, as mentioned above Risk Parity strategies are often levered up to achieve higher risk/return targets, so it’s fair to say these strategies probably represent $1-1.5 trillion in total exposure. However, the assets that really require leverage are very low-risk shorter-term government bonds. The market for shorter-term bonds is arguably the deepest and most liquid market in the world. So it is unlikely that deleveraging of these assets would cause a material dislocation. In addition, due to the risk-balanced approach, more volatile and highly correlated risky assets like equity markets generally represent only about one third of allocations in Risk Parity portfolios. For example, Figure 2 shows the actual weights in our ReSolve Risk Parity strategy scaled to 12% volatility as of July month-end. Note that the strategy has 197% exposure, so it is levered by 1.97x. Notwithstanding this leverage, the equity-like assets in the portfolio add up to just 35% of total portfolio assets, while intermediate term Treasury bonds represent the largest allocation by far. Reality #3: Pro-cyclical Risk Parity effects are mostly offset by counter-cyclical effects. The BAML report in question makes the assertion that Risk Parity strategies all react to an expansion in market volatility and correlations by reducing exposure. But this is not true at all. As mentioned above, Risk Parity strategies come in two distinct forms. Indeed, one implementation of Risk Parity does monitor intermediate market risks and correlations. When these strategies observe that market risks and correlations have changed so that portfolio risk is above the strategy’s target risk, they will lower overall exposure to realign with their target risk. These are pro-cyclical actions that may exacerbate market crises at the margin. However, the other form of risk parity is engineered based on the fundamental drivers of returns in each market environment. This approach is strategic in nature, and does not respond pro-cyclically to intermediate shifts in risks and correlations. Rather, this approach targets long-term strategic asset weights, and acts counter-cyclically in response to market dislocations, by buying assets that have dropped significantly and selling assets that have risen. The question is, what portion of Risk Parity implementations are dynamic vs. strategic. The largest Risk Parity fund, Bridgewater’s All-Weather strategy, is a strategic implementation. This fund represents about $70 billion, not including leverage. We would also speculate that large pension plans that have adopted a Risk Parity approach in-house are more likely to employ a strategic version of the strategy. After all, many institutions require a strategic asset allocation to be vetted by actuaries to justify long-term return and risk assumptions. approach. So it is far from clear that pro-cyclical risk parity strategies will overwhelm counter-cyclical implementations in order to exacerbate market crises. Reality #4 Bank derivative books are orders of magnitude larger than global markets, and are likely a much larger contributor to pro-cyclical systemic risk. It’s curious that a major global money-center bank would choose to target risk parity as a source of systemic risk when global banks themselves are likely a much more destabilizing presence in markets. That’s because banks act as counterparties to the vast majority of global derivatives contracts. According to the Bank for International Settlements the most conservative estimates of the size of the global derivatives market exceeds $630 trillion after netting effects. 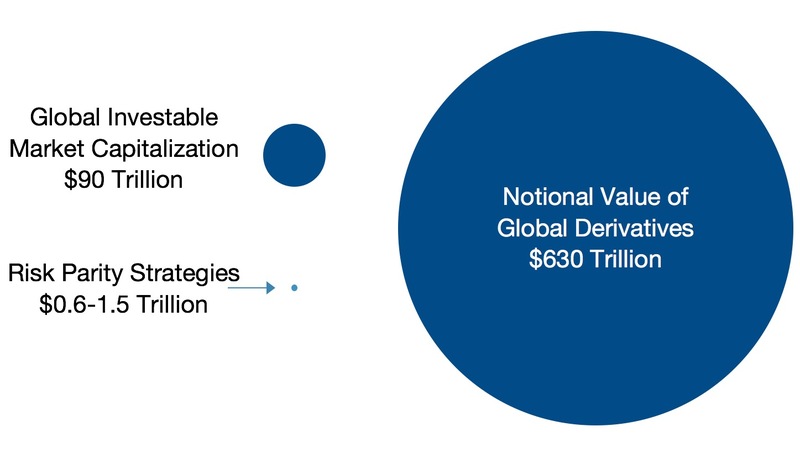 In other words, derivative contracts held at global banks represent over 1000x the notional value of all global Risk Parity strategies. This is important because banks manage their derivatives exposure using precisely the same mechanism that dynamic Risk Parity strategies use to manage their total portfolio exposure. Specifically, banks are constantly monitoring the risks and correlations across their derivative books in order to manage total bank risk exposure. Obviously actions taken by banks to maintain risk exposures in the $630 Trillion derivatives market completely overwhelm the relatively infinitesimal exposure management by dynamic Risk Parity funds. Reality #5: Risk Parity strategies typically do not execute major shifts in exposure in response to large short-term events. It’s important to understand that the application of leverage in a Risk Parity fund is not an on or off decision. Rather, when a Risk Parity fund de-levers in order to maintain its volatility target, the deleveraging occurs in incremental amounts, typically 5-10% of portfolio assets. This is obviously much less dramatic than the potential 50% deleveraging scenarios implied by the BAML report. The fact is, Risk Parity funds make relatively small incremental adjustments in response to changes in market risk, in order to maintain risk balance. The emphasis is on small changes over time in response to observed shifts in the risks and correlations between all global asset classes. Even a fairly material shift in risk and correlation in just a couple of assets is unlikely to trigger a major deleveraging event. Reality #6: Institutional investors exert a much larger pro-cyclical effect than Risk Parity funds could possibly conjure. Even if we acknowledge the possibility that Risk Parity’s net contribution to asset classes is mildly pro-cyclical, assigning proportional market impact is virtually impossible. That’s because there is such a wide variety of amplifying and moderating effects at work in markets. One very large pro-cyclical effect is institutional return chasing. An IMF paper released in February 2016 presents strong evidence of pro-cyclical investment behavior across Central Banks, public and private pensions, life insurance companies and endowments. These entities combined represent more than $24 Trillion in assets. 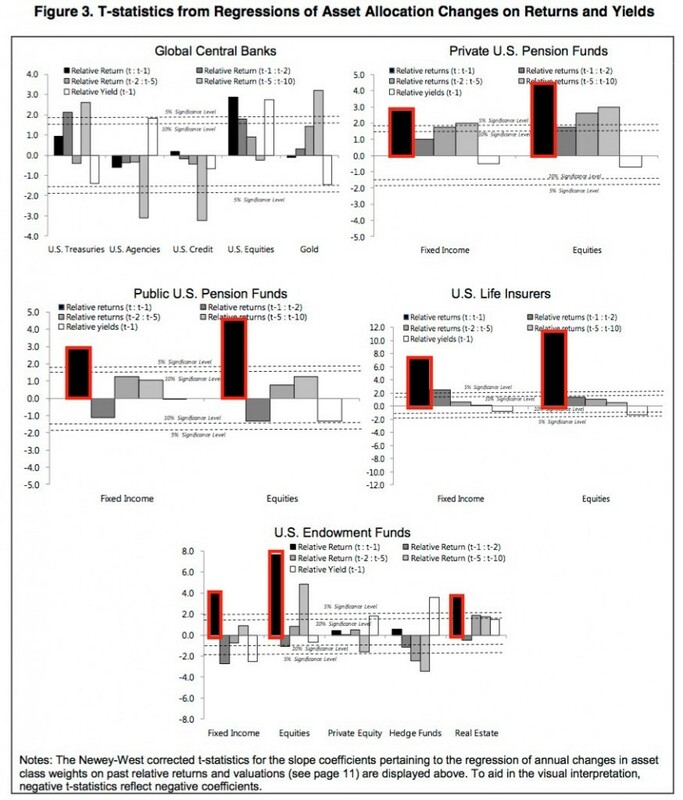 The paper shows that almost all major institutional categories are guilty of chasing into asset classes that have been rising over the recent past, and selling out of asset classes that have been declining. The Figure below taken from the paper quantifies how well past returns explain changes in institutional asset allocation for periods from 1 year through 10 years. As you can see, the most influential factor explaining changes in institutional asset allocation is returns over the past year. Risk parity is about balance. Moreover, because there is a mix of pro-cyclical and counter-cyclical Risk Parity implementations, and; because assets in Risk Parity strategies are small relative to global markets, these strategies probably contribute very little to overall systemic risk. To the contrary, Risk Parity provides an effective way for investors to take maximum advantage of all opportunities available in global markets, in the most diversified way possible. In these uncertain times it’s critical to develop portfolios that are robust and ready for whatever happens next. Want more? Download our Risk Parity Solution Brief now.